At first, Randy Lopez doesn’t get it. Then he seems to ignore what’s happening. What’s happening to Rudolfo Anaya, a reader might ask, reading confusedly into the pages of Anaya’s Randy Lopez Goes Home. magical place up in the mountains so weird Baca’s supernatural Raven would be freaked out. But Randy doesn’t notice, albeit a little confusedly, Randy takes it all for granted. Welcome to Agua Bendita. El Demonio, he’s there. Aphrodite/Venus/Lust/ aka Mabelline, is here, too, and although a little past her prime, she strings out the bait for a disinterested Randy. La Muerte, she’s hanging out at the fiesta making wisecracks. La Llorona, el coco, an old curandera named, not Ultima but Unica. We are hip deep in allegory, allusion, and being swept along the swift currents of the river of life. Full fathom five! Who can save us? Think “An Occurrence at Owl Creek Bridge” or “Steambath” for a frame of reference, unless Purgatory means something. If so inclined, one could quickly look through the author’s afterword, “A Note to the Reader: How Randy Lopez Came to Me.” QEPD Patricia Anaya. The author explains how he put the book together during his wife’s final year with him, the book their final work together. Don Rudolfo has elected his elder’s prerogative to work out that sense of mortality that comes ineluctably as one ages. In this, Randy Lopez Goes Home may surprise a reader’s expectations. Anaya is not revisiting Ultima, nor resurrecting Sonny. Randy’s home is puro magic, the novel a spiritual treatise that comes at times ponderous, chistoso, irritating, allusive, always engaging, and ultimately hopeful. The elder statesman of Chicano letters is working it out. But it sounds silly talking about it, making a checklist of the story’s complexities. Randy Lopez Goes Home speaks for itself in deceptively sparse prose laden with notes on identity, assimilation, change, xenophobia; all manner of life issues, as befits a chicano de senectute. Local boy Randy’s roots go far back in the remote village. He’s written a book, “How to Live Among the Gringos.” Randy fears he has been swallowed up, has become them. His fears find confirmation when, reaching the village, rednecks do their obnoxious thing, and gente who should know him have no idea of his name nor Randy’s familia. He finds no escape from anomie; the usual exclusion from the one world, but lack of recognition from the other. Shaken, Randy realizes he’s been asking the wrong questions. With that his conception of Home becomes an intermediate destination. Now Randy obsesses on bridging the river, to find his goddess, Sofia, over there, to live a future impossible here, on the other, perhaps wrong, side of Agua Bendita. Sofia. That’s “wisdom” in Greek. Randy knows this, he went to night school and sees Scylla and Charybis where La Llorona and La Muerte stand, all sorts of complex intercultural referents. Remember, Randy’s been among ‘em. So even though they took him in, can Randy go Home again? 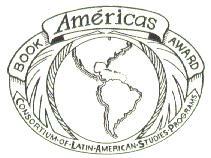 La Bloga friend Roberto Cantú happily shares follow up comments from enthusiastic participants in the recently-concluded 2011 Conference on Sor Juana Inés de la Cruz: Her Work, Colonial Mexico, and Spain's Golden Age. The conference’s website, singled out below, now features a slide show of participants, and towards the bottom, selected videos of readings and performances. Few words come as welcome to an event organizer as unsolicited evaluations. That such messages usually express an enthusiastic appreciation makes the message all the more welcome. Such are the messages Profe Cantú shares upon request with La Bloga. Gerald, for one, writes how serendipity and electric signage brought him to the conference. I just have to commend you on The Sor Juana Conference that took place last weekend. I was absolutely enthralled by the guest speakers and I couldn't have imagined anything less. I was fortunate to see the digital billboard state the date and time as I was leaving work. I teach 8th grade English at Belvedere Middle School so it was very much of a convenience to stop by right after work. I came across Sor Juana in my literature classes and she has always been an inspiration to me, but the conference was just as much as an inspiration too. I hope to attend, and look forward to, similar conferences on the behalf the university and the Chicano Studies Department. I did purchase my shirt, got my poster, and still have my program schedule as a reminder of the muse who still transcends space and time as she still speaks to us till this very day. Hopefully, I can meet you one day due to the fact that I still have some burning questions to ask you about Sor Juana. Once again, thanks, and I am glad the conference was open to the public. It beats any movie out there. A real inspiration. Thanks for the shout-out from one Louisianan to another and your warm and eloquent greeting to the conference participants. It was an amazing experience in every way. Roberto Cantu’s conceptualization of the conference was brilliant, and he and his colleagues executed it with admirable adeptness. When I responded to his invitation I said that my head was spinning with ideas because of the very creative list of possible paper topics he suggested. Now it is spinning with the ideas presented and generated at what was truly an interdisciplinary conference that inspired and energized us all. And it goes on and on with the additions to the gorgeous blog. I very much enjoyed being on your campus and am impressed with everyone I met and everything I saw. Among the most distinctive pleasures of my recent invitation to workshop oracy at the National Latino Writer’s Conference is the opportunity to photograph poets and fiction writers engaging an audience. I plan to distribute the speaker notes for that workshop this month. Among numerous consejos on planning and delivering an effective reading, I advocate a reader play to the camera. Locate the lenses in the house and make it a point to look up from the text and make eye contact with the camera. When you gesture, hold it just a beat, and enjoy a heisman moment. If you’re a photographer, taking an effective foto of a reader involves a good trigger finger and two eyes. Get the feel for your camera’s responsiveness, the delay between press and click. If you can disable flash, do so. Hold the camera close to your body. Keep both eyes open. One eye scopes the actual scene, the other eye glances toward the screen--or looks through the viewfinder—to ensure the speaker is framed. Listen to the reading, get a feel for the reader’s style and pauses. Take lots of exposures. Anticipate when the reader is going to look up. If you see the speaker’s eyes then press the trigger, it’s probably too late. The well-framed portrait is in focus on the speaker, the speaker has eyes and mouth open, the body is animated. Other elements contribute to useful fotos. Dan Olivas, for example, sets up an easel that props up his novel. This is the “silent salesperson” technique. Every time the audience looks at Dan reading, or a photograph of Dan reading, the scene is likely to include the cover of Dan’s novel. I held the camera low and pointed in the approximate direction. I like the feel of this portrait. This is the best reader portrait in the lot. Eyes and mouth open, a gesture with the hands, the silent salesperson up front. Vibiana Aparicio-Chamberlin and Estela Gonzalez are in the house, asking questions during the Q&A and livening up the event. they want me to do something about border fronteras. red and black ink. they want me to . well not they them. membering. un-broken. trails before the tears. of sb1070. with quetzalcoatls y chicano power fists. still stuck on the concrete. there is something done in the words. when i let them go. can dance this ehecatl pintura. the question – Who am I? the history of my people. when I say I’m Chicana. A frequent response was “I knew it! Is not limited to white people. Hopis are convinced I’m Apache. don’t mistake me for Native American. I’m like them, but not really. my heritage, my ethnic identity. the Mexican people of today. as they adapted to life in the U.S.
by being born and educated here. that is here to stay. Raúl Sánchez Raúl Sánchez is a Seattle Bio-Tech technician, translator, DJ, and cook who conducts workshops on The Day of the Dead. Featured in the program for the 2011 Burning Word Poetry Festival in Leavenworth WA. His work appeared on-line in The Sylvan Echo, Flurry, Gazoobitales, Pirene’s Fountain with La Bloga being the latest. In print his work appears in the second Anthology by The Miracle Theatre Viva la Word!, Latino Cultural Magazine, on Bookmarks by the Seattle Public Library 2007 Poetic Art Project, and in the Anthology Speaking Desde las Heridas (Publisher: Universidad Nacional Autónoma de México). Israel Francisco Haros Lopez Israel Francisco Haros Lopez is both a visual artist and performance artist. His work is an attempt to search for personal truths and personal histories inside of american cosmology. The american cosmology and symbolism that he is drawing from is one that involves both northern and southern america that was here before columbus. 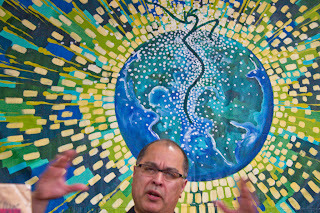 The work both written and that which is painted is attempting to mark and remark historical points in the americas and the world.The mark making attempts to speak to the undeniable presence of a native america that will continue to flourish for generations to come.The understanding which he is drawing from is not conceptual but fact and points to the importance of honoring and remembering ancestral ways of living as a means of maintaining healthy relations with all humans,the winged, all those that crawl on this Earth, all Life, the Water, the Sacred Fire, Tonanztin, Tonatiuh,the Sacred Cardinal Points,everything inbetween, above and below and at the center of self and all things in the universe. Currently the visual motifs are drawn from both a pre-columbian america that had far far less physical, mental or spiritual borders . 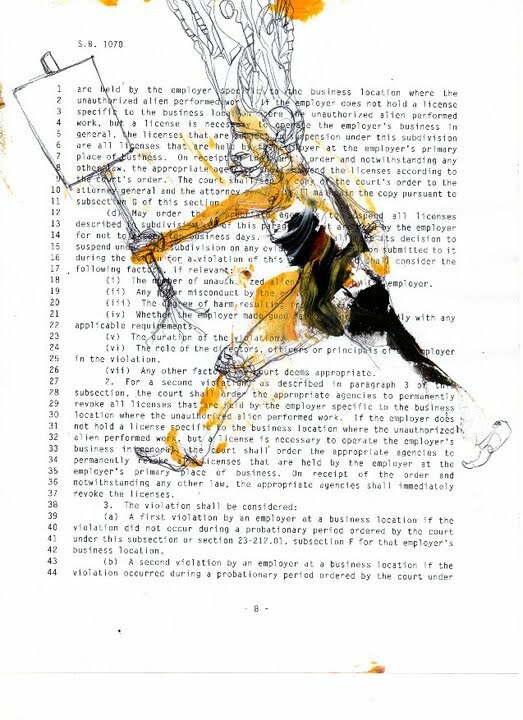 Recent works are exploring Xenophobia in laws such as "SB 1070" both in written and visual format. Israel considers himself an environmentalist poet seeking to awakening those harming our first mother Tonantzin.He also draws inspriation from the contemporary styles of inner city youth who use public space by any means necessary as their method of artistic expression. Israel also draws much of his inspiration from his peers and contemporaries who constantly show him innovative ways to approach cultural and political dilemnas. The written words cannot be without the painted image. The painted image cannot be without words. Neither the written work or visual work can be without sound without vibration, as all things on this earth carry vibration. As such his written and oral work is constantly shifting as it is performed or recording. The same poem,story,monologue or abstract diatribe shifts within the space it is performed taking into consideration audience and the theatrics and vibration of the moment. 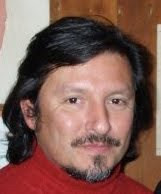 Abel Salas Abel Salas is the Publisher and Editor at Brooklyn & Boyle, an Eastside arts, literture and community journal based in the historic Boyle Heights neighborhood of Los Angeles where he is also part of the Corazon del Pueblo: Arts, Action & Education Collective. 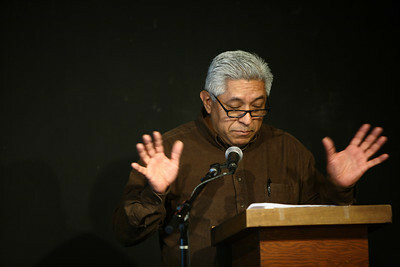 He has taught creative writing in LA County juvenile halls, and his work as a journalist has appeared in The New York Times, Los Angeles Times Magazine, Los Angeles Magazine, Latina, The Austin Chronicle, The Brownsville Herald Oye Magazine, Tus Ciudad Los Angeles Magazine and Artillery Magazine among many others. Salas has been invited to share his poetry on stages in San Francisco and Monterey Bay, Havana, Cuba, Toluca, Mexico and Mexico D.F. and most recently as part of Poets Responding to Arizona HB1070 in Washington DC and at the National Latino Congress held earlier this year in Austin. Since the release early this year of my new novel, The Book of Want (University of Arizona Press), I’ve had readings at about a half dozen independent bookstores up and down the state. 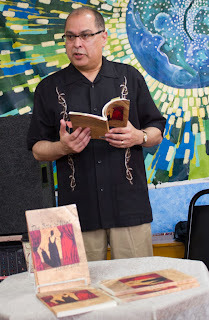 On Saturday, I did my last scheduled book reading at Tía Chucha's Centro Cultural & Bookstore. What a wonderful time I had. I want to thank all those who attended (including Michael Sedano who took the above photo) as well as the wonderful folks at Tía Chucha's (Stacy and Luz, in particular) who made the event go so well. If you missed the book signing, there are a few signed copies at Tía Chucha's that you can pick up. Please support your local independent bookstore! I note that a nice profile of the bookstore by Los Angeles Times writer Reed Johnson appeared on Saturday which you may read here. I don't know if all of you are up to date about the difficult situation the Semana Negra de Gijon is passing through at this time; between the recent elections (when much of Spain swung to the right), the Rector of the University of Gijon's lawsuit to get an injunction on the festival aspects of the Semana (which is now slated to take place on University grounds), and grave budgetary problems, the Semana now finds itself in one of its toughest spots ever. I know a lot of us are more than ready to lend a hand in this crisis. The best thing we can do to help right now is to show our concern about the Semana's future to the powers it depends on. To do this we can use all the social media at our command, including our personal blogs, websites, Facebook pages, letters to the editor, etc...any media we can that will show that we are watching developments, and that the event has massive support. I've created a facebook page called “Continiuidad de la Semana Negra" where you can log in to post your comments and opinions, and leave a record of any movement to save the Semana. I'm sure that between all of us we can save the Semana Negra, not only for this year but for the future. ◙ The June issue of Somos Primos is now live online. 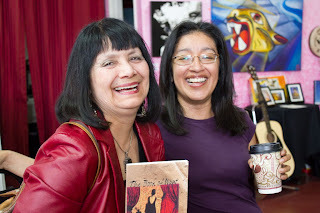 ◙ Check out the Achy Obejas essay, WCF, E-readers & me, over at WBEZ 91.5 FM out of Chicago. For generations, the Eastside was usually seen as an add-on to L.A.'s cultural world, "that" place over there where the Mexicans lived. But, now, due to VPAM's opening, there is a sleek space in East L.A. that can show the art that has its aesthetic roots and inspirations on the Eastside. VPAM's very existence tips the cultural balance in the City of Angels. No longer is every important visual art venue on the Westside, midtown or downtown. ◙ Check out Anacani Serrato’s new blog here. 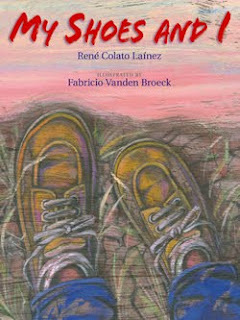 René Colato Laínez's latest book My Shoes & I was just published by Boyds Mills Press. La Bloga has reviewed quién-sabe-cuántos libros in our seven years as a Chicano lit site. But we've never/nunca done a review like this. 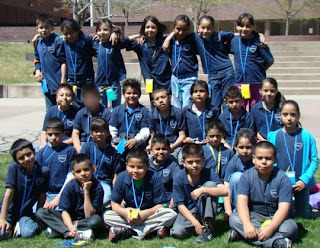 This spring, 26 native-Spanish-speaking third-graders from inner-city Denver assisted me in analyzing and critiquing René's book. These students are not just English Language Learners, or ELLs, as many school systems narrowly define them. 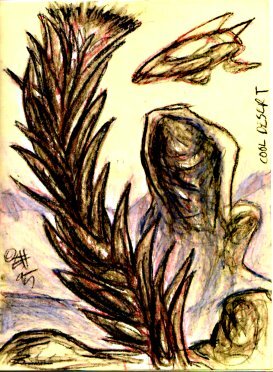 I prefer the term EBEs, or Emerging Biliterate Entities,* to describe them. Yes, they are learning English, but they're also learning more Spanish, along with science, math, history y muchísimo más. And, they are learning the countless aspects of America's multicultural society to function each day and succeed in the future. The critique you read below is one example of the contributions EBEs make to the literary discourse each day for their adopted country. First, here's the publisher's description of the book: "A timely and inspiring story. Mario is leaving his home in El Salvador. With his father by his side, he is going north to join his mother, who lives in the United States. She has sent Mario a new pair of shoes. He will need good shoes because the journey north will be long and hard. "He and his father will cross the borders of three countries. They will walk for miles, ride buses, climb mountains, and cross a river. Mario has faith in his shoes. He believes they will take him anywhere. On this day, they will take him to the United States, where his family will be reunited." As the teacher of these lessons and author of this post, I edited some of what follows. The ideas, insights, opinions y todo lo de más are of the students' making. It's not possible to share all the ideas of all the kids because there's more than 26 pages' worth. The comments below were often posed by several of them, and other questions were sent to René Colato Laínez (RCL) that he will answer on his or the Los Bloguitos website in June. You can also go there to see great critiques of the book by adult and latino reviewers. Below you will exclusively find what children think of it. Analysis of My Shoes & I. Like most of the class, third-grader Edgar and Alan comment on what they learned about literary personification from the book: RCL wrote a good book because he explained it really well and wrote some wonderful details. Like when he personifies his shoes and says "uno, dos, tres and that they are ready to keep going and cross the finish line." Sarahy had a personification question: Did this happen to you, that you treated a thing like a person? BryanG said: The illustrations help the story because there are some tricky words and sometimes the illustrations have the meaning of the word. 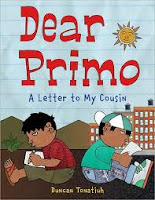 BrianC wonders how an adult could know so much about latino kids' experiences: I enjoyed the themes and personifications like a personal connection I made to when he personified his shoes, saying "sana, sana, colita de rana." That's what I say to my favorite toy dinosaur. Also I wanted to know if someone helped him write the book. Did students feel My Shoes & I was a believable story? 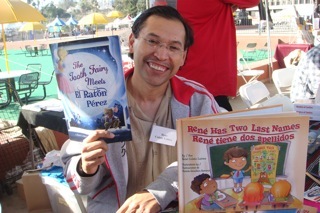 Unlike children's books written by many non-latinos and translated into Spanish that may not connect to the world of bilingual students, René's did pass the kids' standardized test of authenticity. BrianC's last sentence above was often repeated by others, and I was uncertain whether they were questioning RCL's authorship or the fact that his publicity photo makes him look like their older brother. I finally answered this, at least for myself: the kids couldn't get over how real the story was for them, how much they connected with it, how much of their short lives was featured in the story. RubenM: I think Rene did write a WOW! believable story because he wrote spicy words instead of dead words. And I like the pictures. 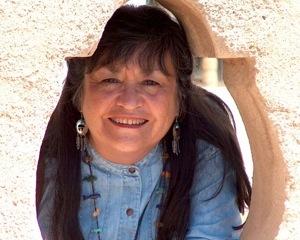 Xitlaly: René wrote a good story because it has personifications. NancyR: I believe that RCL did a believable story because it teaches people many things, like not giving up or that you have to believe in yourself. Brisa: Yes I do think this is a good and believable story because it is a little funny and sad. Jaider: Yes I think this is a good book because it made me sad and happy and it had new words. To some students, like BryanG, the question about believability was simpler: I think he wrote a believable story because he says that a boy and father moved from El Salvador to Guatemala to Mexico and the U.S. and people move like that to other places. Jaclyn: I think yes, because Mario had to cross from El Salvador to Guatemala, Mexico and to the U.S.
One student summarized well everyone's amazement over seeing parcels of their lives in print, as if René might have followed them around with a video camera. Adal: Where did you get the information? How students identify or personally connect with the story. 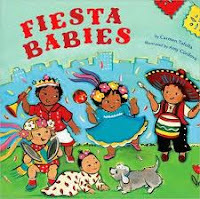 Because a book is written in or translated into Spanish doesn't make it culturally relevant. It requires something more true to life, like what it's like to have to wear worn-out shoes or what it's like walking a path most Americans never had to experience. Xitlaly: The book made me think of when I went to Utah. I walked all the way until we found some houses and got in a taxi. This book also made me remember when my dad crossed from Mexico to the U.S.
Lesley wanted to know: Did René really need to cross the border when he was younger? Marianay: How did you come up with the story? Did you have to walk all the way from where you were born to come here? Rafael: I made a connection to the story. When I like something I take care of it and play with it. RubenM: A personal connection I made is when I was in Mexico and everyone's shoes had holes in the bottom of the soles. JaclynI: I made a personal connection that when I went to Nebraska my shoes got dirty. Nancy: The personal connection that I made is that when I want something I never give up because I really like it. I also believe that I can do it, like when I did CSAP (Colo.'s standardized test) I believed in myself. Jaider: My connection to this story is that when the dogs were chasing Mario he was scared and when dogs chase me I'm scared. Christopher: It reminded me when I had my new shoes and I got them dirty and my shoes got a hole in the sole. My personal connection is when he was talking to his shoes and says "sana, sana, colita de rana," saying everything would be all right. Mario kept going and he never gave up. BryanG: A connection I made is when my mom and my dad went to the U.S. from El Salvador to L.A.
Daniela: A personal connection I made was when I bought new shoes I really loved they became dirty and didn't fit me anymore. NancyR: What inspired you to do this book and how did you think of so many good ideas? Leslie: I did a connection with My Shoes because I had some shoes I liked a lot and one day I saw them ripped because my puppy bit them. Rene, how did you do this wonderful book? Have you gone through these things in your life? Kids gauge if the book is correctly aimed at 5-8 year olds. AlexN: Yes it is kind of hard but I think they can. LesleyE: I do agree that this book should be intended for kids 5-8 because it is not so easy and it's not so hard. I think this book would be good for my neighbor who is five years old. Adal: I agree because they can read it if they practice. Marianay: I agree this is for 5-8 year olds because the words are too easy for 9-16. Edwin: I think yes because everybody can read the book and 5-8 year olds can read. Brisa: I agree this book is for 5-8 because it could be funny to someone or sad to someone. For me, it was sad. Christopher: I think this book is for 3rd grade because it is a little bit hard to read and the letters are too little. It was a lot simpler for Leslie: I agree because it is not our decision; it's RCL's decision. And then there's Daniela: I disagree the book is for kids 5-8 because it is a very wonderful book that everyone would like to read. Even adults should read it. The kids decide whether they'd recommend the book. Daniela: It is a very fabulous book and almost everyone would like it. Lizbeth called it: a cool book. My comment to RCL is I love your book, because we could take it along on a trip. Rogelio: I think RCL did a really good job of writing the book. But for various reasons not everyone agreed, like Alan: I think I disagree because the 5-year-old wouldn't read it. I think it needs to be 7-9. Edgar: I disagree because this book is too easy to read and I think it is higher level. RubenM: I say no because it is a good story and I think it should be for 4 to 10 year olds. NancyR: I disagree. The story is so wonderful I think everybody should hear it because it teaches us a lesson and talks about how they don't give up. Marianay asked René: How does it feel being an author? This and other kids' questions made me realize that many identified with him in a way that would not have happened by reading a Junie B. Jones book. Some now have an inkling that they could possibly become writers like him. He's Spanish-surnamed, so are they. He wrote about the unique, immigrant experience, like theirs. His book encompassed the sadness, fears and hopes of crossing into a new country--theirs. I also thought that the kids' frequent usage of the author's first name, René, significant. How many times have you heard a kid refer to Junie, instead of Junie B. Jones? I think it represents an internalized personal connection that he is a human being-turned-friend because they feel he is so much like them. At least, that's my take. 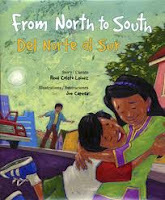 What I've tried to present for teachers, parents, kids, or anyone who wants a culturally relevant gift for a latino child is a summary of the effect that My Shoes & I had on 26 Denver biliterate students of Mexican, Guatemalan and Salvadoran heritage. They were engaged in reading, discussing, analyzing and writing about the book for so many hours, I continually worried they'd become bored or tired of it. That didn't happen. Much of that was due to the rigor imparted from their regular teacher Estherrose, as well as to the students' own yearning for knowledge and love of lit. "Yes, because we are learning about worlds." * EBEs = Emerging Bicultural/Bicultivados Entidades* [entities] This is a take-off on the thinking of bilingual researchers and educators N. Commins and K. Escamilla concerning how native Spanish-speakers have been labeled. The old term of ELLs, or English language-learners, dehumanized children by delimiting the focus of their learning to English, as if that were the most important, or even only, description of them and their learning. Learning English is not the key to academic success; it is just one important, cultural aspect of a much wider spectrum of knowledge they could and should acquire. Yes, they are special, special entities, I term them. Entity: for me the word conjures visions of sci-fi or fantasy, beings with special powers and abilities, sometimes from far-off worlds. 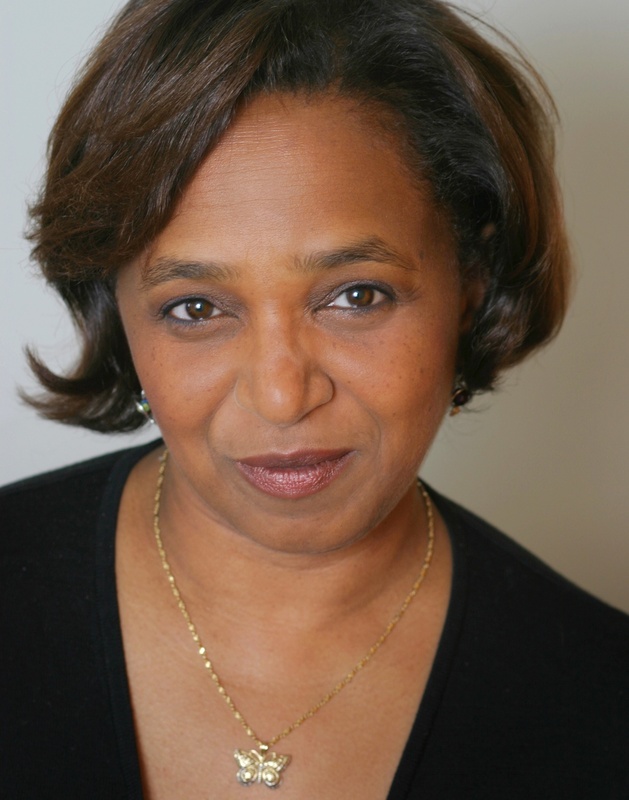 The EBEs' world is indeed far off from what most Anglo American children experience. As Laínez's book describes, it's a world that can begin in places that others can read about, but only imagine. Posted by Contributing Bloguistas: at 1:01 AM 1 comments. Click here to leave a comment. Poet Rolando Ortiz exposes details of his life on Facebook, reveals the top items on his Cholo Bucket List, and posts photos of his food creations and the silly antics of his kids. La Bloga recently sat down with the ex-gangster who was put behind bars at the tender age of nine. 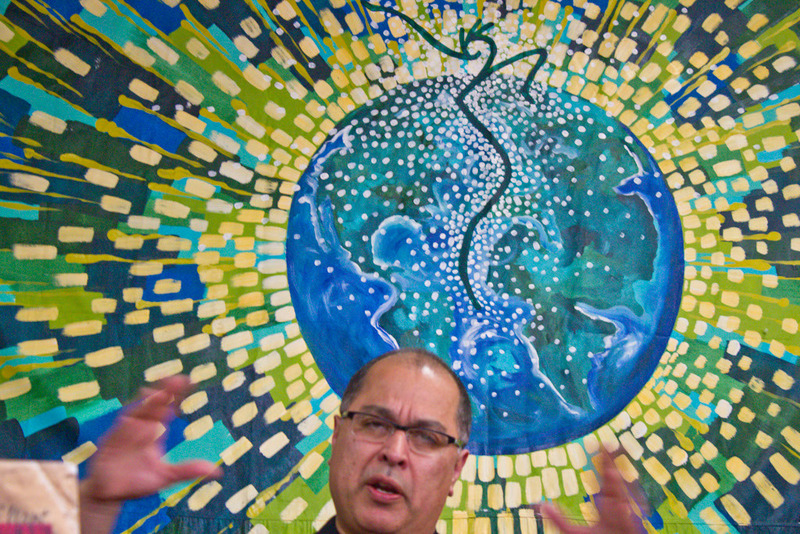 The poet and writing teacher has moved away from a bounce-back system of incarceration. His last arrest was over ten years ago. In his neighborhood, police know him as someone they can talk to. This doesn’t make him exempt from the occasional stops and pullovers for driving while looking like a gangster. However, public speaking is an asset for the charismatic poet who laughs easily and always looks happy. 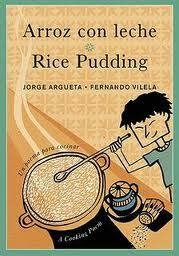 When he’s not writing poetry, he enjoys cooking the Mexican dishes that his mother taught him. He was the youngest of seven kids and credits his mother for his love of cooking. Rolando says he was a chef in a past life and jokes that his cooking is the real reason his fiancé loves him. His Facebook updates are filled with photos of his latest mouth-watering creation. The 36-year-old says his kids love it when he cooks breakfast. 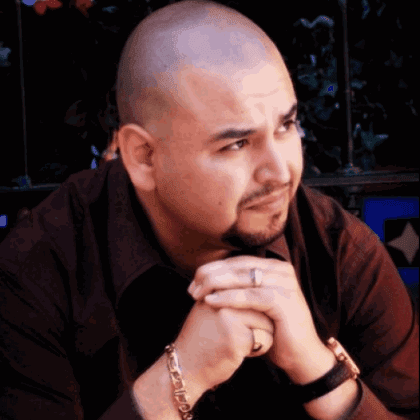 Rolando has been writing poetry since he was a 12-year-old youth at East Lake Juvenile Hall. While inside, he started his Cholo Bucket List to express all the things he wanted to do when released. He shares his Cholo Bucket List with his students and talks about all the things he’s been able to cross off, including hearing the Dalai Lama speak. One of his biggest accomplishments is working with Luis J. Rodriguez who has encouraged his mentorship of troubled youth and his poetry. His poetry influences include Luis Rodriguez, Octavio Paz, Pablo Neruda and Federico G. Lorca, Luivette Resto, and Diego Robles. 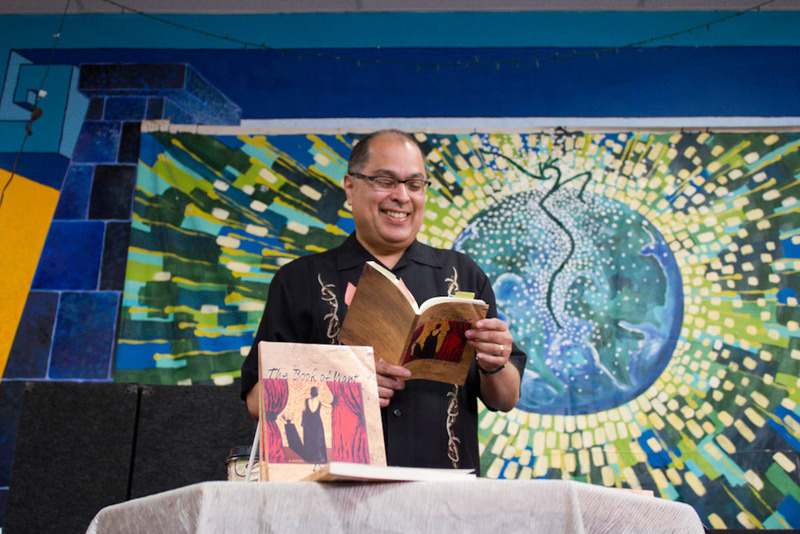 Acceptance among local poets has also been important to Ortiz who also names the meeting of Rafael Alvarado as an important step in his career as poet. “I’ve never met another poet who I’ve hit it off so well,” said Ortiz. “I met Rafael at a literary festival and now I’m part of the Hollywood Institute of Poetics (H.I.P.). Part of his role in H.I.P. is hosting a regular poetry reading at the Paloma Room in Montebello. The barroom setting offers mixed drinks and food. The next event on June 5 from 5:30 to 9:00pm features Liz Gonzalez, Richard Modiano, Luis J. Rodriguez, A K Toney and Diego Robles at 624 Whittier Blvd. Tonight: Friday, May 27 at Beyond Baroque, Muejerismo and Latina Poets. 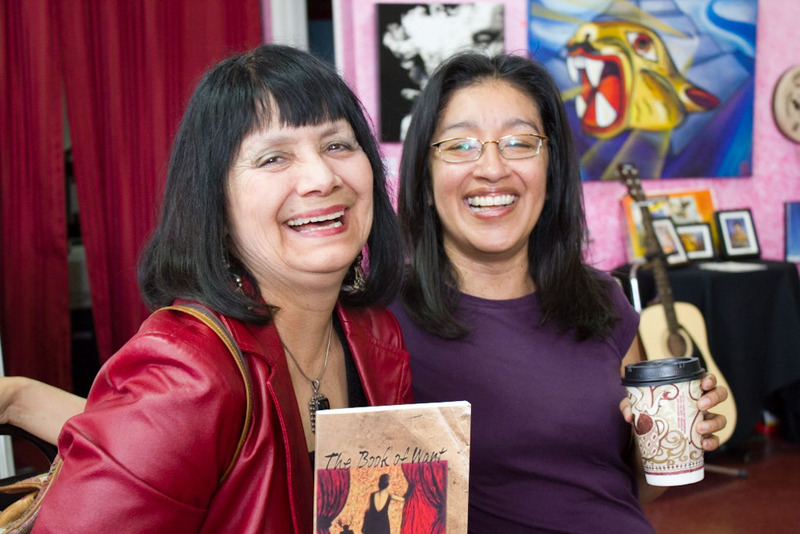 Join La Bloga’s Melinda Palacio, the editor and publisher of Pilgrimage Magazine, Maria Melendez, local poets, Luivette Resto and Frankie Hernandez, and a one-day art gallery presentation by Gabriella Azul Parra at Beyond Baroque, 681 Venice Blvd, Venice, CA 90291, 7:30 pm. Host is Rafael Alvarado. Saturday, May 28, is the 6th Annual Small Press Book Fair, 235 Hill Street, Santa Monica. Melinda Palacio reads with Teresa Dowell and poets from New Poets of the American West: An Anthology of Eleven Western States. Look for the booth, starting at 10:00 am. I’m going to be in ridiculously good mood for a while. 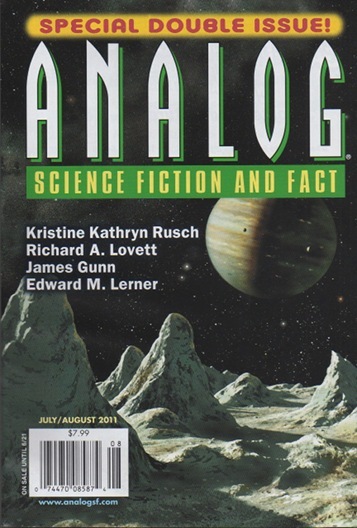 I have a story in the July/August 2011 issue of Analog Science Fiction and Fact, and for a chamuco who dreamed of growing up to sell stories to science fiction magazines, it's quite a high. 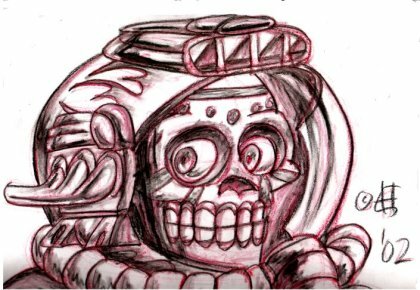 It’s called “Death And Dancing in New Las Vegas,” continuing the saga started in “The Rise and Fall of Paco Cohen and the Mariachis of Mars” that was in Analog back in April of 2001. Yeah, I know, it’s been a while -- it was a rough decade . . . And I wrote the latest story to be read on its own, but for those who are interested it’s available free online through the music-themed speculative fiction podcast anthology Theme and Variations. It deals with the colonization, though I use the term “development,” of Mars by ruthless corporations. Terraforming (making Mars Earth-like) is being done through nanohudu that acts like a virus, transforming the planet and people. And I deal with the problem of who gets brought in to do the dirty work . . . a metaphor for immigration. This idea goes way back with me -- back when I first moved to Arizona to live with Emily. We were taking walks in a nearby mountain preserve and working with some people who were trying to make movies. One of them was a guy who knew a lot stuntmen who rode horses. He needed work because they weren’t making a lot of Westerns anymore. I flashed on an idea for a Road Warrior/spaghetti Western on a terraformed Mars with horses instead of cars. The production company never got off the ground. I stashed the idea in the back of my brain. There it fermented and mutated. I thought about the technical considerations of such a world, came up with the nanohudu idea. Soon it was a Flash Gordon/Edgar Rice Burroughs adventure with lots of bizarre creatures and plants. Unfortunately, publishing was getting weird. Nobody in Nueva York wanted to talk to me. I started to listen to all kinds of advice. Instead of writing the simple story, I generated a bloated proposal for a sprawling epic -- the kind everybody told me was the only thing that was selling. And of course, it didn’t sell. I locked the monstrosity up in my files in disgust, but in a few years, a strange thing happened. While working as a grade school custodian, the character of Paco Cohen came to me. Yeah, I usually don’t create them, they suddenly appear in my brain . . . He took my nanohuduized Mars and turned it on its head, made it more real than I ever imagined. I’ve published two stories about him so far, and have ideas for more. Maybe they’ll become a Martian Chronicles-type book someday. I also have been getting the urge to go back to the original idea of a straight-forward NeoMartian adventure story. Today’s young adult market may be ready for such a thing. Ernest Hogan will be doing Chicanonautica here every other Thursday, alternating with Lydia Gil. Expect wild stuff! Clemente! by Willie Perdomo. Illustrated by Bryan Collier. Holt, 2010 32 pgs. ISBN 978-0-8050-8224-1. 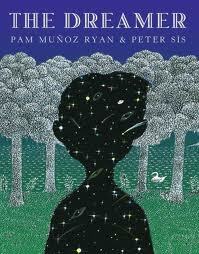 The Dreamer by Pam Muñoz Ryan, Illustrated by Peter Sis. Scholastic, 2010. 372 pgs. 978-0-439-26970-4. Biblioburro: A True Story from Colombia by Jeanette Winter. Beach Lane, 2010. 32 pgs. Dizzy in your Eyes: Poems about Love by Pat Mora. Knopf, 2010. 168 pgs. ISBN 978-0- 375-84375-4. Grandma's Gift by Eric Velasquez. Bloomsbury, 2010. 32 pgs. ISBN 978-0-8027-2082-5. How Tia Lola Learned to Teach by Julia Alvarez. Knopf, 2010. 135 pgs. ISBN 978-0-375- 86460-5. The Last Summer of the Death Warriors by Francisco X. Stork. Scholastic, 2010. 344 pgs. Me, Frida by Amy Novesky. Illustrated by David Diaz. Abrams, 2010. 32 pgs. ISBN 978-0-8109-8969-6. Posted by Rene Colato Lainez at 10:40 PM 0 comments. Click here to leave a comment. Upcoming Casí Now! Poets Workshop.